In 2010 Southern Sportsman Aquatics & Land Management started our Lunker Fish and Bruiser Buck Clubs. A commemorative plaque is presented to our clients who experience an exceptional fish being caught from their waterbodies or a whitetail deer harvested from their land that we manage on a regular basis. The landowner need not be the successful angler or hunter, but we do need a quality photo, name of angler or hunter, date and time caught or harvested, total length, girth and weight of the fish or antler measurements of the deer. 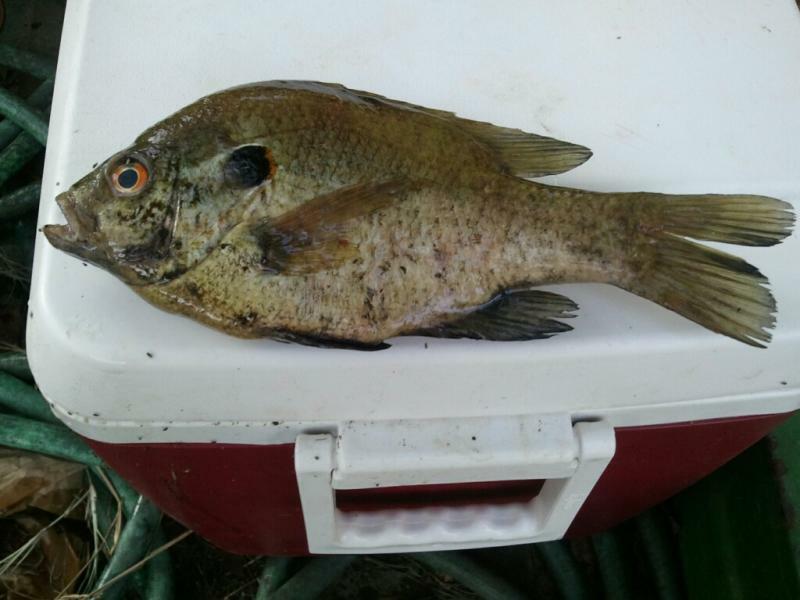 The categories for fish are bluegill, redear sunfish, black crappie, channel or blue catfish and largemouth bass. The size categories are as follows: largemouth bass > 25” or 10 lbs, channel or blue catfish > 33” or 20 lbs, bluegill > 10” or 0.75 lbs, redear sunfish > 11” or 1.0 lbs, warmouth > 10” or 0.75 lbs and black crappie > 14” or 2.0 lbs. Whitetail deer qualify if the antlers scores > 140 inches. Plaques will be presented to qualifying land owners during quarterly site visits. We hope this gets you fired up as much as it does us, so make sure you let us know when an exceptional fish or deer is caught or harvested on your property that we manage. Mr. Jim Fenton (R), Owner of Doe Run Plantation, recieves a Lunker Award from Scott Brown for a redear sunfish caught from one of his lakes in Spring 2012. We actually thought Jim's wife would receive the frst award at Doe Run for her prize warmouths living in one of their ponds in South Central Georgia. Spring 2012, this 1 lbs 2 oz redear was caught at Doe Run Plantation and erned them a Lunker Award. 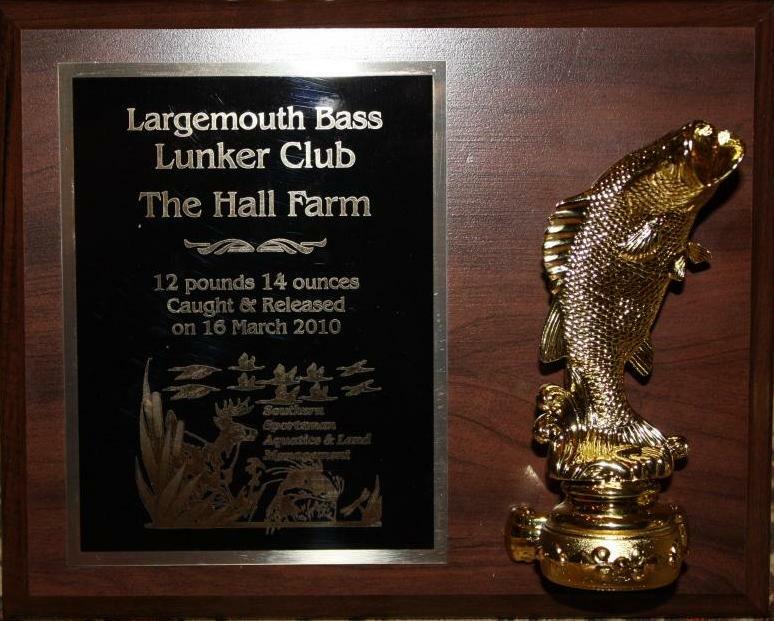 The Lunker Fish and Bruiser Buck Clubs and award plaques were designed by Southern Sportsman Aquatics & Land Management to acknowledge landowners who own properties managed by us that experience exceptional fish and/or deer harvests. It has been greatly embraced by clients and become a competition between land owners for bragging rights within the Southern Sportsman Aquatics & Land Management community. Mr. Ken Hall (left) and Ken Hall Jr. of Hall Farms were the first recipients of the Southern Sportsman Aquatics & Land Management Lunker Club Award! 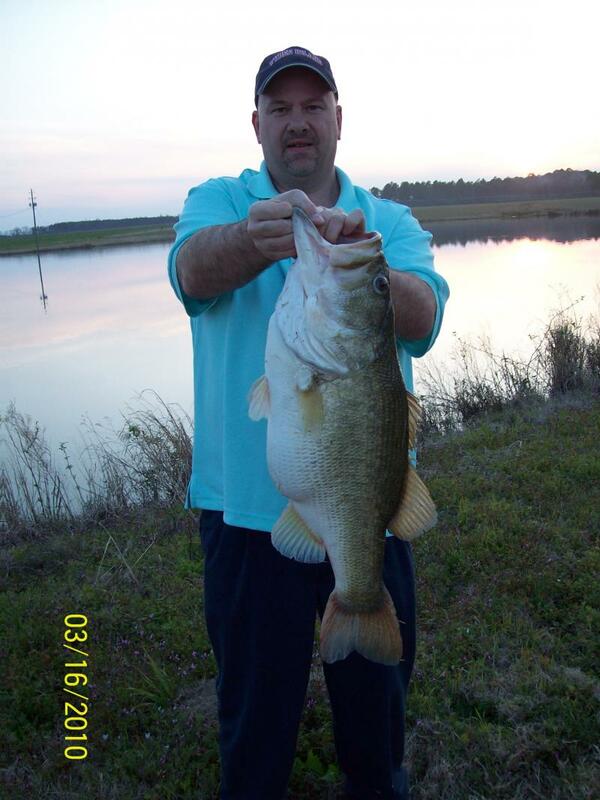 Mr Darin Smith with his 12 lbs 14 oz largemouth bass caught and released from the East Lake at Hall Farms!